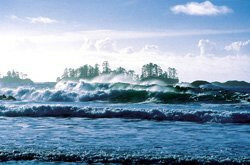 The Pacific Rim region is on Vancouver Island and includes Ucluelet, Pacific Rim National Park Reserve and Tofino. 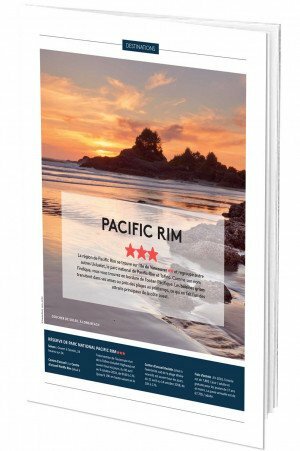 As its name suggests, Pacific Rim is on the edge of the Pacific Ocean. Grey whales pass close to the shoreline in the spring during their annual migration north to their summer feeding grounds, making whale watching one of the region's main attractions. Visitor centres: The Pacific Rim Visitor Centre (located at the intersection of Highway 4 and the Tofino-Ucluelet Highway) is open daily September-June from 10 a.m. to 5 p.m. and July-August from 9 a.m. to 7 p.m. The Kwisitis Visitor Centre (located at the south end of Wicka­ninnish Beach) is open daily from early June to early October, 2019 from 10 a.m. to 5 p.m.
A variety of different trails, such as Wickaninnish Trail and Schooner Trail, lead down to the beach, all of which take under an hour to walk. Located between Ucluelet and Tofino, this vast stretch of sand is ideal for casual strolls and is a real surfers' paradise. Don't miss sunset over the Pacific Ocean. Big Tree Trail is located on Meares Island, accessible only by a 10-minute boat ride from Tofino: one of the most enjoyable ways to get there is by sea kayak. 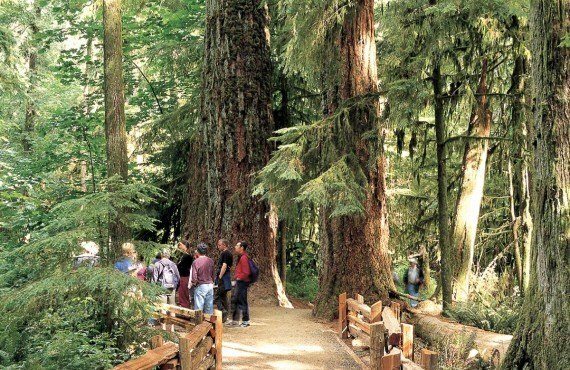 Big Tree Trail has some of the largest trees in British Columbia and leads to the largest western red cedar tree on the west coast. The trees of the old-growth forest are about 1,500 years old. It is an enchanting place to go for a stroll. 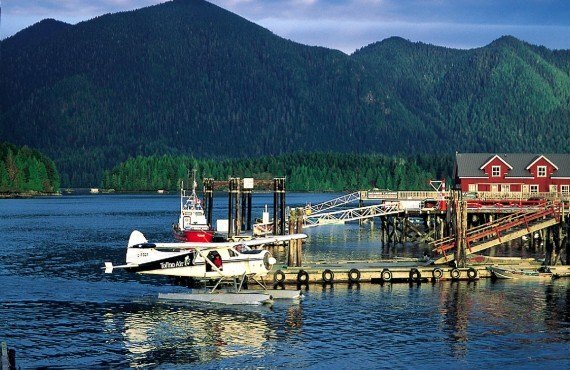 We recommend Remote Passages Marine Excursions in Tofino (Wharf Street). 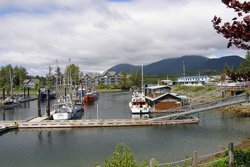 Despite its reputation as "Canada's surfing capital", Tofino is first and foremost a charming village of fishermen and artists. You will enjoy strolling through its streets, visiting its First Nations boutiques and art galleries, or taking a break in a café or one of its many restaurants. The stunning and diverse natural environment is worth the detour to the other side of the island. Located in the heart of Pacific Rim National Park Reserve, Radar Hill offers magnificent views of Tofino beach at sunset. Easily accessible by car. Don't miss it, time and visibility permitting! 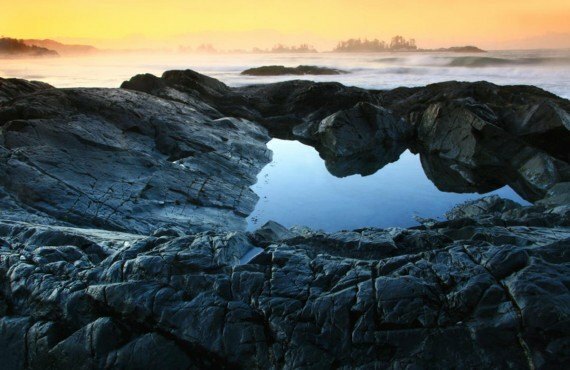 Ucluelet has many beautiful art galleries, several of which are located on the main street through town. These galleries are a great way to learn more about First Nations culture, which still has a significant presence in the region. 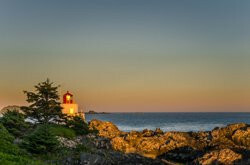 The Wild Pacific Trail in Ucluelet, on the west coast of Vancouver Island, is in fact a network combining three exceptional hiking trails: Lighthouse Loop, Brown's Beach to Artist Loop, and Ancient Cedars & Rocky Bluffs, with a lotal length of about 9 km. 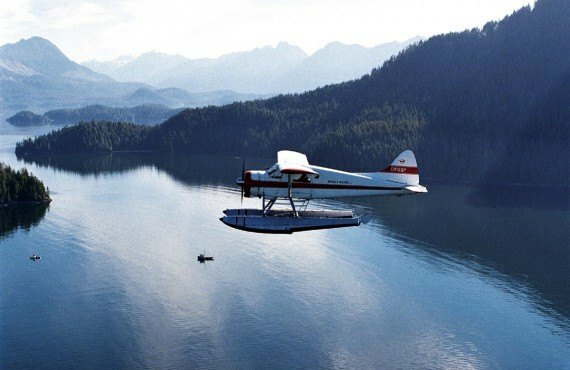 Venture into BC's temperate rainforest, along the wild Pacific coast. If you only have time to walk one section, it should be Lighthouse Loop, starting from Amphitrite Lighthouse. This easy 2.6 km loop (45-60 minutes to walk) features many viewpoints and benches offering dramatic views of the ocean and Barkley Sound. The sunsets over the water are spectacular! The Wild Pacific Trail was brought to life through the efforts of a visionary affectionately known as “Oyster Jim Martin”, and access has always been free. Secure donation boxes are provided on site for visitors wishing to make a donation to the Wild Pacific Trail Society to help build and maintain the trails. 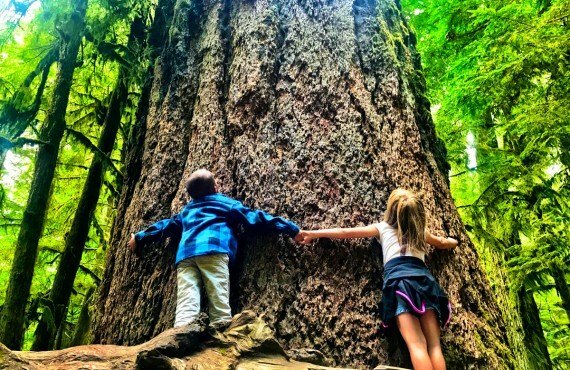 Free interpretive walks are offered every morning in summer at 10 a.m.
Cathedral Grove is a majestic stand of giant Douglas fir trees in MacMillan Provincial Park. On your way to your next destination, be sure to stop and take a stroll under the shadow of these towering pillars untouched by the modern world. Open daily from 7 a.m. to 11 p.m. The park is 25 km west of Qualicum Beach and 16km east of Port Alberni, on Highway 4. This unusual short hike just outside Port Alberni is an interesting place to stop and stretch your legs! The short 25-minute round-trip walk takes you through the forest to the famous Hole in the Wall, a massive man-made hole through a shale cliff along the banks of Rogers Creek, which was once a shortcut for the city’s water pipeline. The pipeline was eventually removed, leaving a hole with a picturesque waterfall, a favourite spot with the locals. Park at Coombs County Candy Store (and stock up on candy while you're there! ), then cross to the other side of Alberni Highway where you will find a gravel path just to the right of a low concrete wall. The beginning of the trail is unmarked, but wooden signs further on mark the way to the waterfall. On the way to Tofino, be sure to stop at Wally Creek, a beautiful rocky section of the Kennedy River, with waterfalls and water pools. About 50 km (45 minutes) after Port Alberni, you will see a car pull-out area and "love lock" fence on the right side of the road. There is generally space to park. This is a fabulous spot to stop and stretch your legs, have a picnic or even go swimming. Be very careful as the rocks can be quite slippery and the river current is strong. 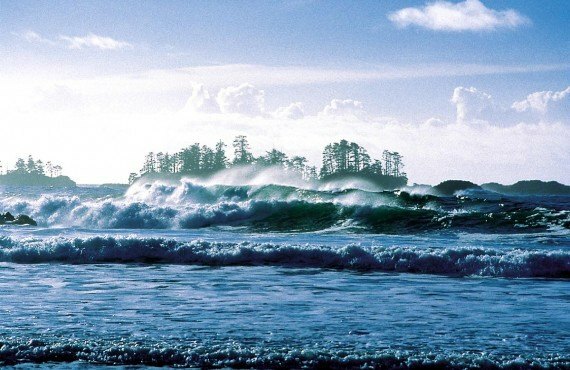 With its 35 kilometres of open beaches, Tofino is the surfing capital of Canada, and the ultimate place to learn to surf. The town is home to more than a dozen surfing schools offering a variety of formulas, from classic group lessons to family, children's or private lessons, for every level. The ocean water is extremely cold, but with your “wetsuit” on, we promise you won't feel a thing! 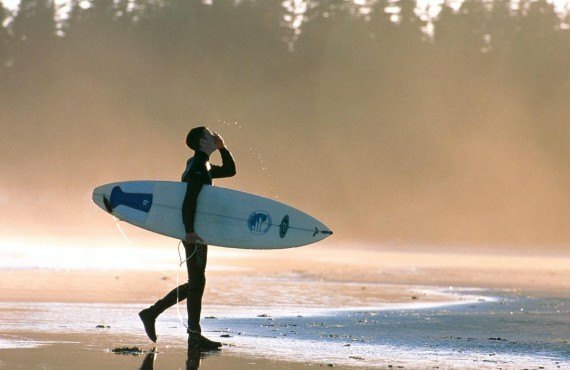 Founded in 1998, the Pacific Surf Company was one of Tofino's first surf schools. They offer lessons year round, and all equipment is always included. The maximum student to instructor ratio is 5:1, so you can be sure of getting lots of personal attention and instruction. Between March 2018 and the spring of 2020, a major road improvement project is planned for the Kennedy Hill area of Highway 4 (adjacent to Kennedy Lake), over a distance of approximately 1.5 km. This may have a significant impact on your movements, depending on when you are driving through the area. In general, single-lane alternating traffic will be enforced during the day (which could cause delays of up to 30 minutes) and the road will be closed for certain periods overnight. If you're in the mood for some simple fare prepared with love, head to Jigger's food truck for the best Fish & Chips in town! Also serves a variety of delicious burgers. Open Tuesday-Saturday from noon to 7 p.m. This Tofino restaurant is often packed on weekends, attracting a colourful crowd of locals and visitors. The Tofino Surf Bowl with wild salmon is one of the house specialties. You can be sure that all the fish is freshly caught! Open daily from 11 a.m. to midnight. One of Tofino's top restaurants, The Pointe offers the most spectacular views of the Pacific Ocean. The menu is varied and the focus is on locally-sourced, high-quality ingredients. The weekly tasting menu provides guests with the chance to sample a variety of fresh seafood fished in the very waters overlooked by the restaurant. This option costs a little more than the regular à la carte menu. Open daily from 8 a.m. to 9 p.m.
Fine dining in Ucluelet. Norwoods is dedicated to serving the freshest local seafood, creatively prepared in an eclectic mix of styles. Connoisseurs will appreciate the wine pairings recommended by the in-house sommelier, featuring local BC wines. Dinner reservations are recommended. Open Friday-Tuesday from 6 p.m. to 11 p.m.
Ukee Days is a 3-day family-oriented festival celebrating west coast life. 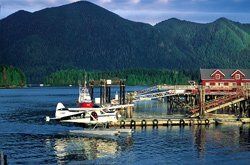 The peaceful fishing village of Ucluelet comes alive with activities including live concerts, logger sports, a parade and a salmon BBQ.